For the past 2 summers, Nora has begged me (daily) to have a lemonade stand at the end of our driveway. Last summer, I told her she had to wait at least a year so she could actually do the math to give people change. This summer, she can do the math… so I had to come up with more creative reasons why we shouldn’t/couldn’t do a lemonade stand. But alas, I couldn’t persuade her to give up her pipe dream of a lemonade stand… especially since she officially put it on our Summer Fun List this year… so we HAVE to do it. Last week, we decided we would do a stand on Monday afternoon — but we weren’t going to do lemonade. 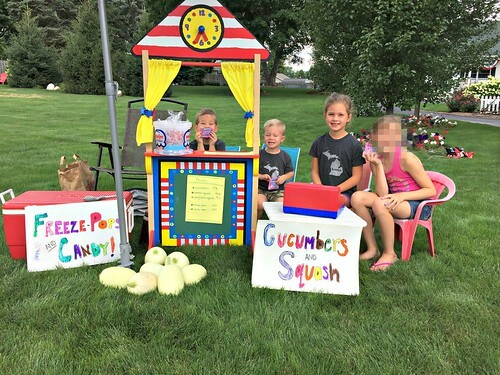 We would sell freeze-pops, bags of candy, cucumbers, summer squash, and spaghetti squash. I had a feeling the sale would not be successful. I had a feeling it would be a “waste” of my time to sit out there with the kids in the hot sun. I had a feeling they wouldn’t sell much of anything… but I went through the motions to set everything up on Monday afternoon. I even posted pictures to my personal Facebook account so local friends and family would know about our sale in case they were driving close to our house. We opened shop at 1:00pm, and by 1:15 the kids were already wondering what was taking so long, why no one was coming, how much longer we had to sit out there and wait, etc. etc. We lasted just over 2 hours and got a whopping 4 sales (it was honestly even worse than I thought it would be!) and although the kids were fairly disappointed, I realized the afternoon wasn’t a total waste because we all learned several life lessons. No, it wasn’t fair that we spent a large chunk of time preparing for our sale but hardly made any money. No, it’s not fair that some of our friends have had very successful lemonade stands but we didn’t. No, it wasn’t fair that only ONE of our neighbors stopped by (even though several others were outside at various times). None of these things are fair… but life isn’t always fair. The sooner they realize this, the better! 2. We need to follow through, even if it’s not fun. Our plan was to keep the stand open for 2 hours — but after the first 15 minutes, I honestly wasn’t sure we’d make it. I did let James go inside with Dave and Clara because the stand really wasn’t his idea anyway, but I made Nora and Simon stick it out for the full 2 hours. Can you see how excited they are! There were countless moms with kids who drove past our stand without giving us a second look; and Nora was SO shocked that all our neighbors didn’t immediately flock to our stand. But then, totally out of the blue, a hot-rod car pulled into our driveway and big muscular guy with tattoos all over his arms got out. The kids instantly walked closer to me and hardly made eye contact with the guy. Surprisingly, he pulled out his wallet and bought one of everything we were selling! He was our best customer of the day and SO nice to the kids. They were super excited to tell Dave about “the guy with tattoos”… and I was super excited to use that as an example of why we should not judge people based on what they look like. 4. Trial and error is a really good way to learn. This lesson is mostly for me, but it’s still worth sharing! However, if I wouldn’t have let them do this stand, they would have continued to ask about it day after day, week after week, all summer long. I could tell them over and over that it wouldn’t be fun or successful, but until they actually realized it themselves, they wouldn’t have believed me. Now, I can safely say that I don’t think they’ll be asking me to set up a lemonade stand for them any time soon! Our freeze-pop, candy, squash, cucumber stand wasn’t all that fun, and only made us about $7 (which we used to go bowling the next day) but I suppose we all learned quite a bit in the process. I suppose our afternoon wasn’t totally ‘wasted’ after all! Mommy Guilt -- Why Do We Do This To Ourselves? I have never stopped at a kids’ lemonade stand. I also have never let my kids have one, for same reasons you mentioned here! I am impressed you made them stick it out two hours. And you stuck it out with them. Our lemonade stand is slated for Saturday and I have resisted for all the reasons you mentioned. We are doing it with the two kids next door and my 3 are sooo excited. Pretty sure we will not be busy but the fun of planning by the kids has been a great use of their time. Including a free cookie for the 25th customer – they are ambitious! As for me I agree the upside of doing it far outweighs the constant asking. wow — good luck! Hope all goes well and they make many sales! we all do it! I will definitley take more time to stop now though. I know how excited my kids would have been if even 2 or 3 cars had stopped! I’ve been following your blog for the past six years. I check in daily…and I’m never disappointed. What a great mother you are. I love that you have God at the center of your family and that you are raising your children with values, discipline and a whole lot of love. God bless you and Dave and those four precious babies. Yesterday morning Jeff Bezos mom was on public radio talking about the value in children failing or at least things not turning out as well as they expect. She signed him up for football even knowing he wouldn’t be good at it since he typically only wanted to do what he was good at. Good experience taking risks. This is great — thanks for sharing Charyse I might have to keep these ideas in mind for a few years down the road. I love this idea! I’m definitely going to have to remember it for when my kiddos are older. We live in the country, also. A traditional lemonade stand is definitely not possible. haha… the tattoo guy was really sweet. 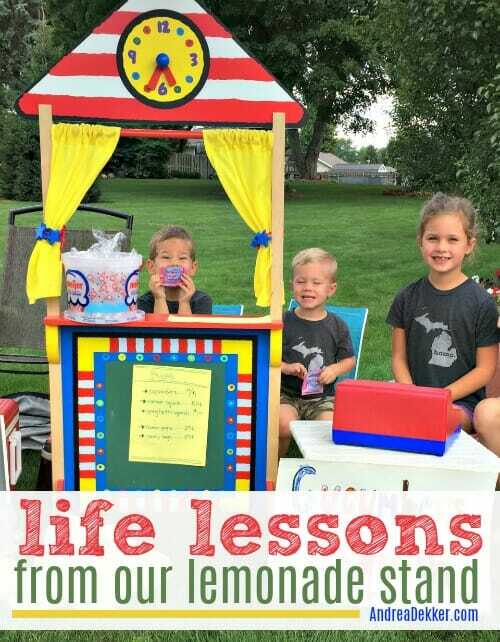 I stopped to buy lemonade a few days ago from some kids, following my husband’s example of “always try to support kids working to earn”. Their mom was there, watching, but the theee kids did all the work interacting with and serving their customer. So far, so good. But they only gave me half of a solo cup for $1. And WOW, it was the worst lemonade ever! I think they must have really diluted it to stretch their supplies. Back to lesson #1: life isn’t always fair! Ha! I thought our freeze pops for $0.25 would be a big hit… I guess not! This post made me giggle and roll my lip down in sadness for them too. We passed by a lemonade stand not too long ago and it frustrated me that I didn’t have any cash on me. I’ve gotta stash a few dollars in the back of my wallet for instances such as these. Such a cute set-up with cute little kiddos. I absolutely loved Nora’s enthusiasm and her thought process. She’s going to do great things. My kids have BEGGED me to do a lemonade stand for years now, but I kept putting it off for many of the same reasons as you, the biggest reason that we live on a dead end street with virtually NO traffic and our neighbors are mostly all elderly (we live in an association). But a few weeks ago I decided to say yes. It was a HOT day and we only had a few customers (thanks, construction workers!). We didn’t stay out nearly as long as you did but at least my kids aren’t asking about it anymore. 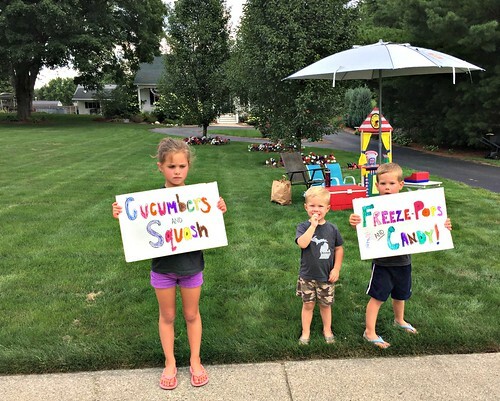 And I learned the same lesson Lorrie mentioned – always stop when you see kids selling something as it will make their day! I know… I think I’ll always stop from now on! Thank you for sharing this! I live in the UK so lemonade stands aren’t all that common, but I do remember taking all my old toys to a jumble sale (kind of like a garage sale but all the neighbours have stands in one place like a car park or church hall). I thought I’d make a fortune but it was just a long old day like yours! I loved reading about the guy with the tattoos! How kind of him to stop, and lovely that you spoke to the kids about it afterwards. Hope you all enjoy the rest of the summer! yes the “tattoo man” was amazing. I have a feeling my kids will remember him for a while! When my brother and I were young(elementary age), we asked my mom if we could make a lemonade stand. She stuck us out on a medium that was in the middle of the street perpendicular to our home. We were two kids alone trying to make some money. Haha! One lady in a huge van drove up, stopped, and threw a dollar bill out at us. We felt rich. Haha! That was our first and last stand. 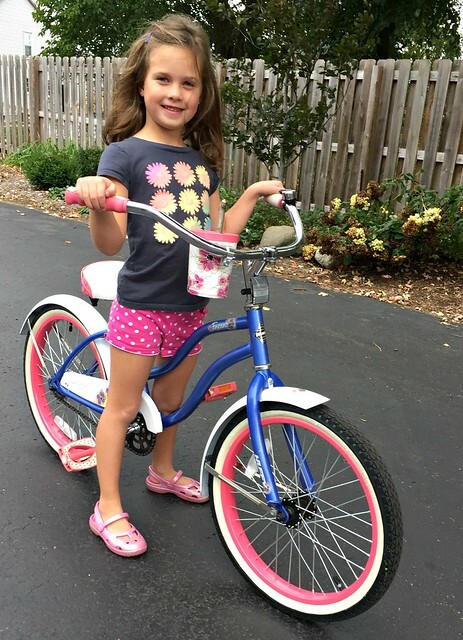 Maybe for Nora’s birthday as part of her present instead of cards, people could use the money they would use to buy her a card to “buy” something from her “bake sale”/lemonade stand set up inside your comfy house. Haha! I love this post, because I am a first-born and often struggle when my kids aren’t all happy and good with things. What a great reminder to help them work through things and teach good character lessons!!! LOVE the birthday party baked-good stand! I might have to implement this somehow! That’s pretty funny. My 7 year old “persisted” in wanting a lemonade stand also. We live in the country, and it’s not really practical to stop on our road (nor do we get many passersby). I let her take her cardboard stand to town to her grandparents house. I think she did it for a while for a day or two, and has now also realized that it wasn’t that profitable or fun. good for you for letting her do it though! and good idea to do it at the grandparents house! Good job, Mom! Looks like you made lemonade out of lemons. Seriously though, one of my favorite quotes is, “The master has failed more times than the beginner has even tried.” I don’t know who originally said this, but it is something I have to remind my perfectionist self over and over. oh, that’s a great quote! Thanks for sharing Kim! And yes – I agree wth Lorrie’s comment! I should always stop and buy from any kids’ stand. Your set-up was adorable. I can’t believe you only got four customers. And I love that the tattoo guy bought one of everything! The kids certainly learned a lot by doing this! I’m glad that the kids followed through with the stand (and James got to go in because it wasn’t his idea-) I’m a retired teacher and see that they learned many things by doing this! You’re right–life isn’t always fun or fair!! Nora and James’s “sad” faces in that one photo cracked me up! Lesson #5 (for the rest of us)… stop and buy something next time we see a child with a lemonade stand! YES! I literally almost typed “Lesson #5: Always stop when you see kids selling something!” but I didn’t… because it’s not really a “life lesson” but you could definitely make some kids’ days by stopping.